​ Harry Powell (Mitchum) is an itinerant preacher, conman & murderer, hell bent on destroying what he believes the Lord hates, namely “Perfume smellin’ things, lacy things & things with curly hair.” His main line of work seems to explaining in preacher-ly fashion the story of love & hate, as tattooed on his knuckles, bilking widows out of their money & then killing them. When a cellmate, condemned to die for murder, admits to hiding $10,000, Powell has a new calling, searching for the money and killing anyone who gets in his way. Finding & seducing the widow Willa Harper (Winters) is no difficult task for the smooth talking preacher man, nor is wheedling his way into her young daughter Pearl’s (Bruce) heart. Where he has difficulty is with her son John, a weary and standoffish child, suspicious of everyone & protective of his sister & their secret knowledge of the money’s location. Once married to the widow he commences to pump her for the money’s location & when she clearly doesn’t know he dispatches her & trains his wrath on the children. When the children escape and find their way to a home for orphans run by the kindly Ms. Cooper (Gish), all appears lost for Powell, until a chance encounter leads him right to the children & the inevitable standoff between goodness and evil. 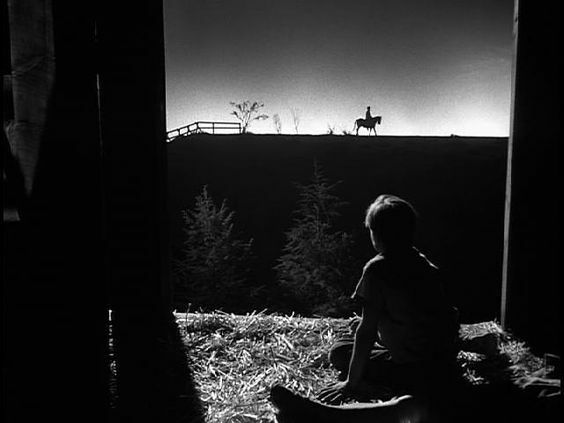 The Night of the Hunter is a film about the battle between good & evil. As Powell repeatedly explains the tattoos on his knuckles in terms of the struggle mankind has between the two, he could just as easily have been describing the struggle within himself, accept there is only malice and hatred. The good in his story becomes an abstract until the third act of the film and only then through the destruction of Powell & the evil incarnate he represents does goodness prevail. While evil has many faces, including malice, lust and most particularly greed, goodness in the form of Ms. Cooper & innocence in the form of Pearl are rare. 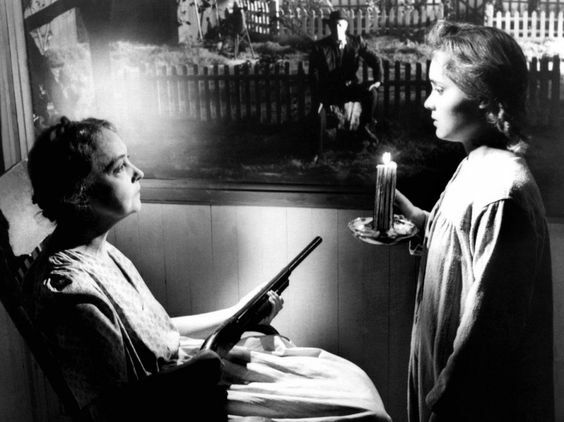 Goodness ultimately wins this battle, but as laid out in The Night of the Hunter, evil will rise again and is a powerful advisory. Nobody could embody the physical menace that Robert Mitchum could when a part called for it. Physically imposing, with huge hands & shoulders, Harry Powell is one such character, filled with animus and hatred, a cypher walking the earth destroying the innocent. 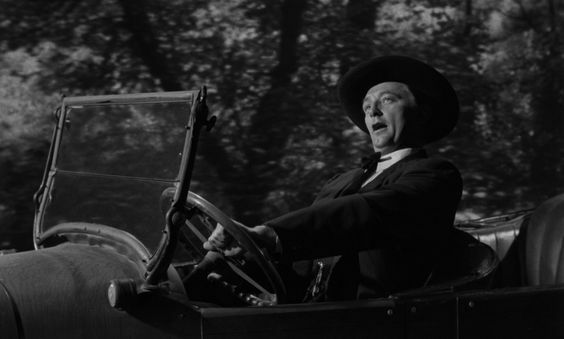 Mitchum’s portrayal of Powell is unlike any other performance in his cannon. 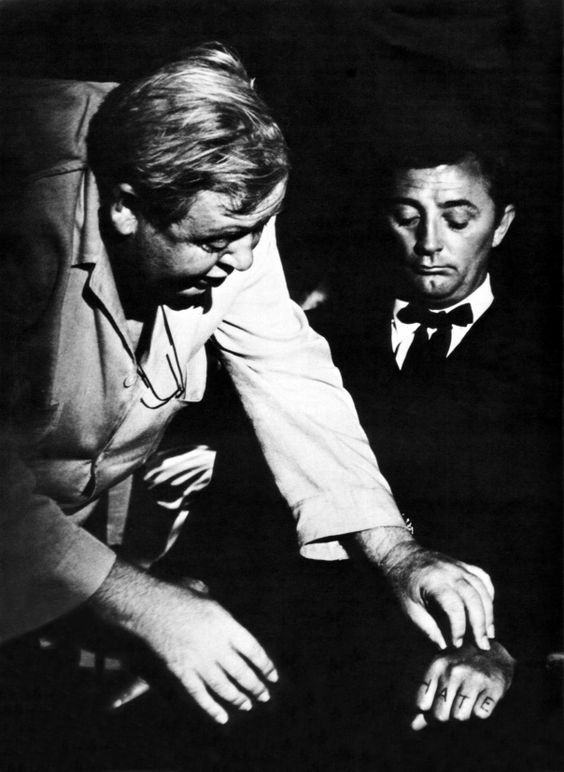 Producer Paul Gregory thought of Mitchum immediately after purchasing the rights to the story, noting “he was a man who could project great charm, and yet there was a sense of evil lurking under the surface.” (Server, Robert Mitchum P. 265) While Powell has much in common with Cape Fear’s Max Cady, however, Mitchum’s performance is very different. Cady is classic Mitchum, calm, deliberate and thoughtful, just in the guise of spiteful vengeance, while Powell is a talkative charlatan, perfectly comfortable spinning webs of verbal deceit as he inflicts his malevolent charm. While still moving in the deliberate fashion that Mitchum’s character typically move, the verbal barrage Powell unleashes on those he is hell bent on deceiving casts a spell that intoxicates. He finds the weak spot in any person’s character, then attacks that weakness with word play until they either submit or are eliminated. Walt Spoon is easily turned to drink & Willa Harper has first lust in her heart, then the righteous teaching of God as she blindly allows Powell to lead her to her death. Mitchum worked with Laughton to hone his character, while the director set about to create a mise en scene unlike anything that was being made in Hollywood at the time. Mitchum’s manner of speaking & the dialogue itself were both from another era, with flourishes of Southern gothic and sing song gospel elocution, all meant to destabilize his victims and the audience. Similarly, Laughton & cinematographer Stanley Cortez used the images to cast a disquieting aura on the movie as well, shooting Mitchum upside down while he delivers lines in the jail cell, for example, putting him in silhouette while riding his horse across the countryside & creating the illusion that Powell’s bedchamber as some kind of church nave. In each instance, they warped expectations by either adding levity, placing Mitchum outside of society looking in or further twisting the religious overtones of his character. Considered expressionistic in its visual & verbal style, The Night of the Hunter was not well received when it was first released. Many of the techniques Laughton & his team used were considered passe by the mid-fifties. 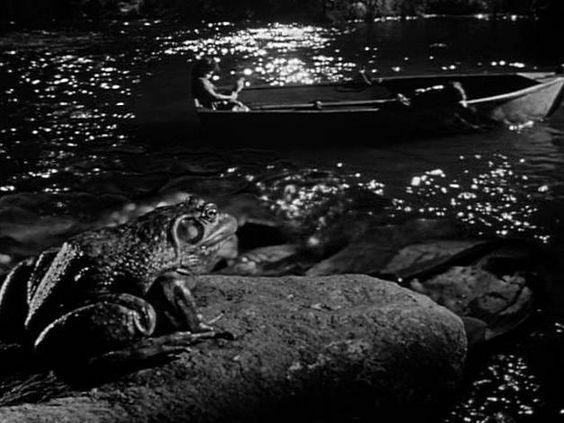 Forced perspective, like the scene in the churchlike bedroom and intense use of shadows created a dreamlike feeling throughout the film, played counter to the naturalistic style of filmmaking prevalent in 50’s films like On the Waterfront (’54) & Marty (’55). Furthermore, United Artists, which had financed the film, had no idea how to promote it. Lee Server, Mitchum’s biographer wrote about the film saying “like Citizen Kane (’41), King Kong (’33) & The General (’26), and few others-that seemed to come out of nowhere, following no tradition or precedent, a work of astonishing originality.” (Robert Mitchum: Baby, I Don’t Care. Lee Server. P. 272) It’s originality was cold comfort to Laughton, who reportedly sunk in to a 7 month long depression and never directed a film again. *Davis Grubb, the novelist of The Night of the Hunter, would only write on trains and refused to travel on anything other than a train or a bike. He provided sketches of the scenes from his book, as he imagined them, & sent them to Laughton throughout the production. *Lawrence Olivier was once interested in the part of Preacher Powell, but Laughton always thought that Mitchum was the only actor and particularly the only American actor right for the part. *The figure in the car at the bottom of the lake is a wax figure of Shelly Winters & 8 huge arc lights suspended by a crane lit the scene shot in a large tank on the Republic lot. Wind machines were positioned to carefully blow her hair and the seaweed to create a dreamlike shot. *The Night of the Hunter was shot in just 36 days.